The European armaments company Airbus has begun flight tests on a military training area of the German Armed Forces to use formations of manned and unmanned aircrafts. According to the daily Die Welt, Airbus is testing the swarm flight in combination with a manned fighter jet in Putlos-Todendorf on the Baltic Sea. This so-called „Manned Unmanned Teaming“ (MUT) is to be used in the new combat aircraft that Airbus and the French company Dassault Aviation intend to jointly develop over the next 20 years. However, the swarm flight capability is to be available for other aircraft as early as 2025. The German-French project for a „Future Combat Air System“ is abbreviated FCAS. At the ILA, Airbus and Dassault declared their willingness to carry out initial studies, and in June the French and German governments confirmed their support in a letter of intent. Because Airbus is already leading the European development of the „Eurodrone“, Dassault is taking the lead at FCAS. From 2025, it would be possible to work on an airworthy model and then further European arms companies and governments would be involved in the project „according to the level of state investment and the principle of the best contribution“. The flight tests in Putlos-Todendorf are to be continued in October. They are part of the first trial phase of the project, the results will then be presented to the military. According to plans, they could be included in a joint concept study this year, in which the German Armed Forces and the companies define the requirements for the new air combat platform. The combat aircraft used in FCAS operates as a so-called remote carrier. In its „Military Aviation Strategy“, the German government describes the FCAS as a „system network (a so-called „System-of-System“) which, in its final stage of expansion, provides air-supported effectiveness across the entire spectrum of capabilities and intensities“. According to the Defence Minister, the „Eurofighter“ and the „Eurodrone“, which will be ready for series production by 2025, could also be integrated in the FCAS. Further weapon systems to be networked are the „Tornado“ and the combat helicopter „Tiger“, Airbus also mentions the Airbus A400M and cruise missiles. According to the Ministry of Defence, the FCAS can be used to intercept enemy aircraft or in case of suspicion of terrorism by combat aircraft in so-called alarm rots. In the war zone, the system is intended to fight „the enemy’s air war potential in the air and on the ground“. It is also intended to support the „fight against forces on the ground“ and the „war at sea“. Finally, the aircraft and drones used will also be equipped with sensors for reconnaissance and surveillance. Airbus has announced that some of the manoeuvres will be flown autonomously, but does not explain this further. Automated functions could in a future stage include the use of weapons. The German government rejects this at the present time and advocates at the United Nations to outlaw autonomous weapons. With a majority of 566 votes to 47, the European Parliament recently adopted a resolution banning killer robots. Both initiatives, however, refer only to „fully autonomous“ weapons systems, in which the decision to use weapons is also taken from machines. It is questionable, however, how this will be implemented in air combat with other combat aircraft or drones, or whether they will be able to decide for themselves on the timing once they have been released. Airbus has already tested some autonomous capabilities on the Baltic Sea. According to the „Welt“ report, up to five „larger drones“ with a wingspan of about three meters „flew in any controllable formation flight in combination with a manned Learjet“. The aircraft simulated a fighter jet accompanied by the drones. They followed the aircraft at a distance of up to 15 metres and with a height difference of 20 to 50 metres. The formation was then to avoid various dangers. Flying in a swarm requires fast and smooth communication between the participating aircraft. The FCAS will therefore communicate via satellites and the data will be processed in a military cloud. Airbus is developing these required capabilities in the „Network for the Sky“ (NFTS) system. It integrates radio links via various geostationary satellites flying at different altitudes. Because this is still too slow for some scenarios, Airbus also wants to use laser-based satellite connections for FCAS. The group remains vague about this, but the German Aerospace Industries Association (BDLI) mentions Airbus‘ laser-based „space data highway“, which the armaments group is building with massive public funds and marketing alone. According to the Ministry of Defence, Airbus has assumed all development costs in the FCAS project. However, the Airbus drone was tested as part of a research programme financed by the Federal Office of Defense Technology and Procurement. 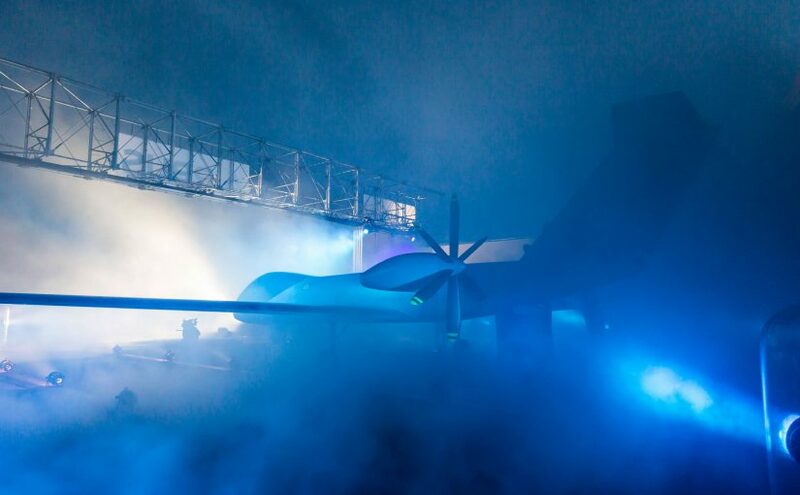 It is also possible that Airbus benefits from the research on its air combat drone „Sagitta“. It is powered by a jet engine and exists as an airworthy demonstrator on a scale of 1:4. Last year, the drone climbed up from the South African Overberg test site for flight tests for the first time and flew on a pre-programmed course. Image: The „Eurodrone“ at ILA 2018 (Airbus).